Designed to meet the demands of your toughest tempo runs and long runs is the Nike Zoom Fly. For its latest release, the favorable runner now comes in a sleek Black/White colorway. Constructed with a nearly seamless one-piece Flymesh upper fully dressed in Black that includes White contrasting accents on the Nike Swoosh logos. A full-length carbon-infused nylon plate mixed with a Lunarlon sole combines soft and firm foam for a balance of shock absorption, stability and response, without sacrificing comfort. 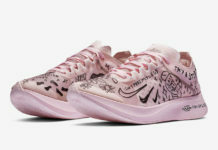 You can now find the Nike Zoom Fly in Black/White available directly on Nike.com. The retail price tag is set at $150 USD.